I get asked a lot of questions. It's an occupational hazard as a teacher and trainer. Some people are curious; some are trying to get to some missing piece of a puzzle; some want a kind of power. Much of our communication is transactional: we want questions to get a job done but not to do more than that. We don't always want to be influenced or even to have much influence; often we just want what we want. If what we want is influence - either to sell or to manage or to teach - then we have to move to a new kind of question. Great questions are not about information; they are about creating a channel through which information will flow. When someone asks a great question, we begin to connect in new ways, sometimes with the person who asked and sometimes with ideas or experiences that we had not connected before. That new thinking - that learning - can create it's own momenturm. Before content was king, before the web was a giant vessel waiting to be filled, before advertising. . . content described a state of satisfaction. We often say we wish that we were more content, more capable of being satisfied or happy. Sometimes we mean it. We mean that we are tired of chasing things that don't satisfy us while we are chasing them or even when we catch them. We mean that we are tired of trying harder and reaching farther. Sometimes we wish we could slow down and simply be. . . content. We are the content of our lives, but we are seldom content. Into each life a little hope does fall, an intimation that something better, brighter, more satisfying is just out of reach. Because we reach for that something hoped-for, we reach beyond the boundaries of what is true today. We push the envelope - at least a little. Obviously, I have given much thought to why I do what I do. Running a small training company might happen by chance if one started with a prosperous career in corporate training. It hasn't happened by chance for me. I made an unlikely choice. I continue to wake up most mornings knowing how many other ways I could work that would pay better and require less effort. I also wake up knowing that the one and only reason I teach NLP is that I love what I do. There is probably no "real" reason for love of anything - there are explanations that inevitably fall short of the whole story. Love seems to be a quality that emerges from tangible benefits and then grows beyond them. That being said, here are three of the reasons I love what I do. On September 19 and 20, 2009, members of the NLP Canada Training community will welcome participants to The HOPE Symposium, two days featuring 20 NLP-trained speakers making TED-style presentations on how they are promoting, encouraging, developing and creating hope in their lives and work. 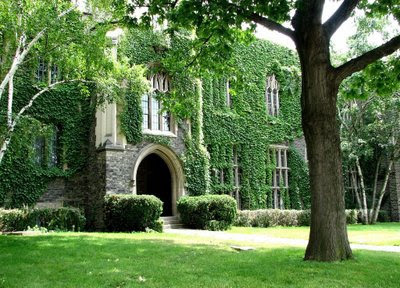 We'll be meeting in a fabulous room with beautiful high ceilings & windows at Emmanuel College, one of the University of Toronto's most beautiful buildings. It's going to be an amazing way to launch the fall. NLP is a set of practices that creates, supports and develops hope. The practitioners we have trained are working in fields as diverse as sales, coaching, fertility, organizational development, training, IT and small business. Some of them use NLP consciously and explicitly to get results for themselves and others. Some of them have simply learned NLP lessons on how to elicit, maintain or develop rapport or high performance states and are busy creating results. I am blessed with a business partner who has a great big laugh. It starts so deep that sometimes the only signs of it are a few bubbles on the surface. But when it bursts all the way through, everyone in the vicinity gets soaked through the skin with laughter. To be able to laugh like that is a gift. We live in a world where we spend too much time allowing ourselves only the bubbles on the surface of that laugh. We are polite and professional and we are living on the fumes of real laughter. We need the good stuff, the deep stuff, the stuff that pulls all of our attention into the serious task of laughing really, really hard. We all need a good belly laugh - and then another one. Laughter is not precisely joy. It comes from a place where joy is possible and shakes up our perceptions so that joy might be possible here, too. It comes from a place where energy and connection and desire are alive and abundant. It comes from a place of hope. Occasionally, I meet people who are abrasive or argumentative or who ask too many questions with too little interest in the answers. Sometimes I meet people who let me know immediately that there is something about me that they don't like. Sometimes they have a long list of things about a situation that don't measure up to their standards. I might think (or say) "I'm really not liking this person." It's not true that I like everybody. But I do end up liking everybody with soft eyes. And part of my quest as a trainer is to find the moment when other people's eyes will soften. Soft eyes came up in recent training as a concept that meant looking at a person or a situation with a non-judgmental, open curiosity. It comes from the world of NLP that probably borrowed it from the world of Aikido. If you scroll down past the list of links on the left side of this page, you'll find a youtube video that you will recognize as an imaginative way to interrupt patterns and make room for fresh thinking. Help Owen meet his goal by rating it with lots of stars! Then take a minute and notice what would be more fun in your own work if you could turn your preconceptions upside down and walk on the ceiling for a few minutes. We just finished another practitioner training. We have found a really cool way of enhancing the training experience. I am sure there are other companies out there that do this and we have a tremendous amount of fun doing it. In the summer we normally run two simultaneous trainings. One is scheduled on Weekends and one is an intensive that runs the full week prior to the final weekend. Then we ntgr8 the two groups and what richness we have found doing this. Today we wrapped up our double summer course and it gets to that terrible time. For me it's usually in the last five minutes of the course. In that time, it becomes almost painfully unbearable to see that the course has come to an end and we have bonded so incredibly tight with you that it's hard to imagine there won't be another day we meet again in this circumstance. Insomnia is a funny thing... I used to work with a lot of different clients of the years who would say they just can't get to sleep tonight. I have to say that rarely happens to me in such a way that I would consider myself an insomniac. However I used to wonder and get quite excited about the sense of possibility I would experience if I couldn't sleep then I could really use that time to be more productive in other areas of my life. I would use that re-frame on my clients and as simple as that sounds it would often work. When faced with the idea of having to work all night, most of my clients would rather just sleep. So here I sit writing to our blog. I rarely have time to write to it, more often you would find Linda on here championing our last quest, stirring you with thoughtful ways to think and live and be happy. And I sit here cause I can't sleep. How do you react when everything comes together? When it all just works? There are times when we do what we do with confidence and with competence and with joy. Our teams come together and turn diversity into a strength and, often, a reason to laugh. Our thoughts come together and connect old ideas in new ways. Our senses notice more and our minds seek out new ideas and new experiences. We connect with more of ourselves and feel good. We connect more productively with others and feel good. Stop right there. Notice what is happening. Appreciate it. ap⋅pre⋅ci⋅ate [uh-pree-shee-eyt] Show IPA verb, -at⋅ed, -at⋅ing. 1. to be grateful or thankful for: They appreciated his thoughtfulness. 2. to value or regard highly; place a high estimate on: to appreciate good wine. 3. to be fully conscious of; be aware of; detect: to appreciate the dangers of a situation.